In my last post, we looked at the background to the concept of the 80/20 Principle as first laid out by Vilfredo Pareto and as researched by Richard Koch in his book The 80/20 Principle. In this second post, we will investigate strategies for applying the 80/20 Principle to our everyday lives. Not all of our time is equal. We are more productive at some periods in our day over others. We achieve greater satisfaction and enjoyment in our activities at certain times over others. The key is to determine the specific 20% of our time that yields the greatest results and overall satisfaction, and then attempt to expand our results and satisfaction by investing more time back into the high-yielding activities of that 20%. It is not shortage of time that should worry us, but the tendency for the majority of time to be spent in low-quality ways. Speeding up or being more "efficient" with our time will not help us; indeed, such ways of thinking are more the problem than the solution. 80/20 Thinking directs us to a more "eastern" view of time. Time should not be seen as a sequence, running from left to right as in nearly all graphical representations that the culture of business has imposed on us. It is better to view time as a synchronizing and cyclical device, just as the inventors of the clock intended. Time keeps coming around, bringing with it the opportunity to learn, to deepen a few valued relationships, to produce a better product or outcome, and to add more value to life. We do not exist just in the present; we spring from the past and have a treasure trove of past associations; and our future, like our past, is already immanent in the present (p. 152). Not all of our relationships are equal. Certain key relationships bring greater rewards and greater happiness. Anthropologists assert that we as human beings are hard-wired for only a few key relationships to begin with, and once these slots are filled, they are filled forever. The book asserts that this may explain the observation of superficial relationships in those whose profession or circumstances force them to have a great number of relationships, such as salespeople, (dare I say pastors? ), or those who move very frequently. Next, allocate a total of 100 points between the relationships in terms of their importance to you. For example, if the first person on the list is exactly as important as the next 19 down the list combined, allocate 50 points to him or her. You may need to have more than one run at the numbers to make them add up to 100 by the time you're finished. 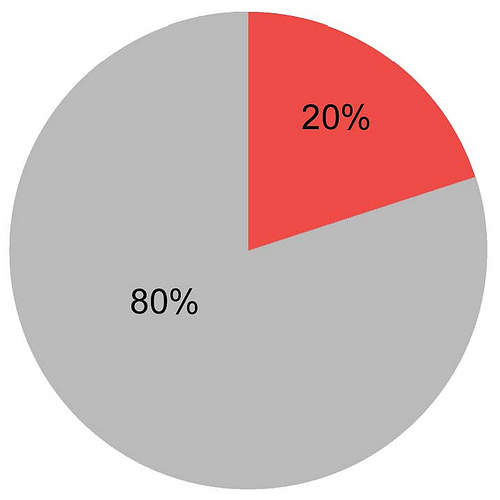 I don't know what your list looks like, but a typical pattern in line with the 80/20 Principle would have two characteristics; the top four relationships (20 percent of the total) would score most of the points (maybe 80 percent); and there would tend to be a constant relationship between each number and the next one down. For example, number two may be two-thirds or half as important as number one; number three may similarly be two-thirds or half as important as number two; and so on. It is interesting to note that if the number one relationship is twice as important as number two and so on, relationship number six is only about 3 percent as important as number one! You get the point. The importance is the quality of our relationships, not the quantity. Go deep with just a handful of people, focusing your time and emotional energy on them. Not all of our work is equal. Whether you work for yourself or for somebody else, you were most likely hired (or you started your own business) in order to produce a few specific important results. When we get settled into our work role or get our business up and running, we unfortunately get bogged down with a number of other extraneous issues in our work that pull us away from the two to three primary objectives that we should be pursuing - the ones we were hired in the first place to accomplish. So, what do we need to do to to live out 80/20 in the workplace? Be sure that you are very clear on the specific 2-3 big results you were hired to accomplish (or created your own business to accomplish). Religiously focus on growing those 2-3 key results each day. Align the majority of your daily tasks (your 20%) to focus on and accomplish the key results (your 80% of results). Whenever possible, delegate everything else (your 80% of tasks) that falls outside the boundaries of the 2-3 key results. Say "no" to anything and everything else as much as possible. Reinvest and expand on your top 20% that achieves 80% of your results. This will have a multiplication effect! We as Americans must face the fact that money dislikes to be distributed equally. Our politicians are always at work attempting to redistribute what the wealthiest of us create, but it won't work. The wealthy know how to create more cashflow through business, investments, tax loopholes, and so on. But what does it mean for the American Christian to live an 80/20 life with the money God has entrusted to our management? First, we must live a generous life. A hallmark of a life transformed by Christ is generosity. We must "send on ahead" as much as we possibly can through giving back to God (what is already His in the first place) of our time, talents, and money. This truly becomes the top 20% of our resources that leads to eternal rewards in heaven one day. Second, we focus on managing the money God has given to us to the best of our ability. This means having financial goals, an estate plan, the various types of insurances, a budget, and so on. We live below our means, depending on God to provide for our families. Third, we shed and cut back as much as possible on the lower 80% in order to reinvest in the top 20%. We must get to the point where we are thoughtfully and purposefully managing God's resources that He has entrusted to us in order to have the greatest Kingdom impact. Although I'm certainly not a proponent of living out our lives in order to solely pursue happiness through hedonism, we can structure the time, relationships, work, and money that have been given to us by God in such a way that will bring an increase to our overall happiness and satisfaction. Of course, it should go without saying that our overall happiness should spring forth out of our joy in the Lord. The joy of the Lord is our strength (Nehemiah 8:10). Identify the times when you are happiest and expand them as much as possible. Identify the times when you are least happy and reduce them as much as possible. For the Christian, I would assert that the times when we're truly happy and filled with the joy of the Lord are the moments when we are giving back to the Lord and to others; the times we are truly fulfilling His mission for our lives here on earth. I would also assert that the times we are least happy and fulfilled are the times we are focused on ourselves, living a life of selfishness. We should focus more time and energy on our top 20% in the arena of happiness by giving more of ourselves away, and at the same time, we should be reducing our selfish tendencies. Are you living an 80/20 Christian life in the areas of time, relationships, work, money, and happiness? Why or why not? In Part 3, we will look at the ultimate example of the 80/20 principled life for the Christian - Jesus himself. Are you difficult to fire?